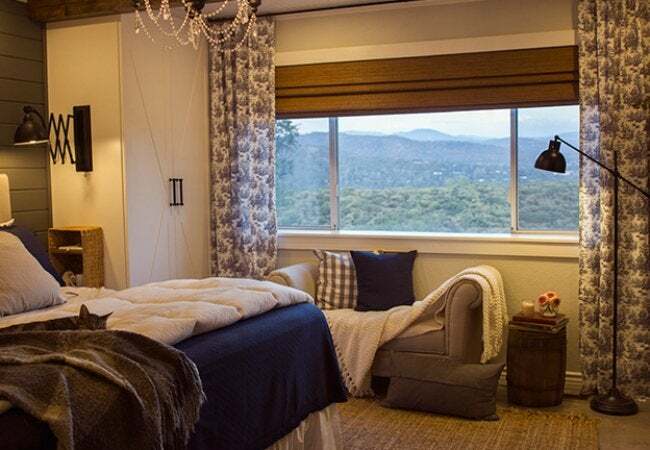 When challenged with a bare-bones master bedroom short on personality, designer Jenna Diermann dreamed up—and built in—loads of rustic charm to match the home's spectacular mountain view. 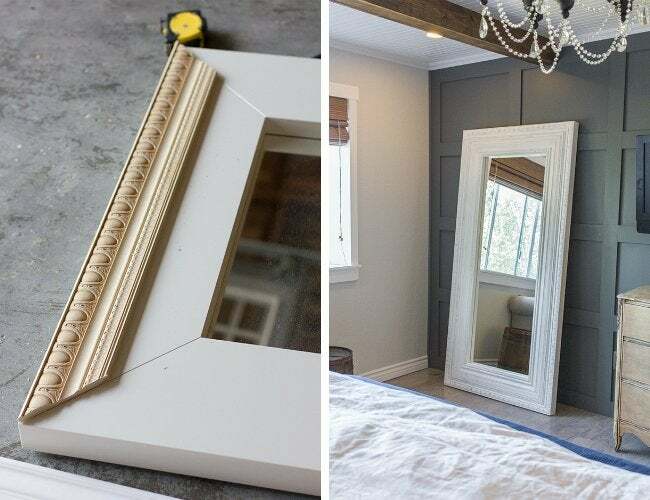 For the DIY details behind this total transformation, read on. Shortly after moving into a 1970s fixer-upper in the foothills of Northern California, Jenna Diermann—owner of Jenna Sue Design Co, an online shop specializing in personalized art prints—got right to work making it feel more like home for herself, her husband, and two cats. The bedroom, in particular, lacked personality but held loads of potential. Remaking the space was no small undertaking. Dierman strategically divided the effort into smaller, discreet DIY projects. The result speaks for itself. For the benefit of others who might try to emulate what she’s done—and to satisfy our own curiosity—we asked Dierman to share what led to her choices and what she learned along the way. Since you basically designed the room from scratch soon after moving into your new home, how would you describe the space when you first started? Builder-grade basic beige. It was an empty box that lacked any character whatsoever, but it did have a large window overlooking the mountains, which was a great feature. 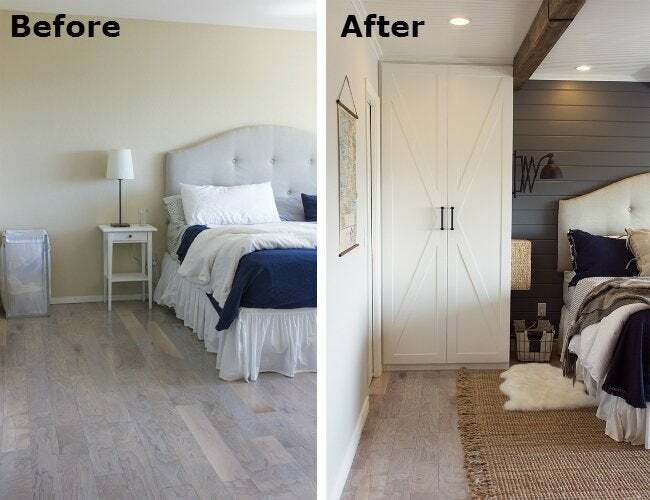 What were some of the goals you had in mind for the master bedroom’s transformation? To create a cozy, relaxing environment for our family to unwind at the end of the night. I think you can get a bit more creative in bedroom spaces, so I wanted something to reflect a little of all of my favorite styles—cottage, cabin, farmhouse, and rustic with a touch of romance. I also planned to add more closet storage space by creating built-ins with a designated vanity area for my jewelry and accessories. Where did you go for your inspiration? Pinterest is always the first place I look for inspiration—but that really just means other blogs, designers, and spaces that have a similar style. I wanted to let the environment dictate the direction. Living in a small mountain town filled with natural beauty meant more rustic elements like wall planks, ceiling beams, wood tones, natural fibers, and muted shades. There were definitely challenges within the DIY projects, but I spent a lot of time planning and scheduling each step so that we were able to stay on track. It all turned out very close to what I had envisioned. 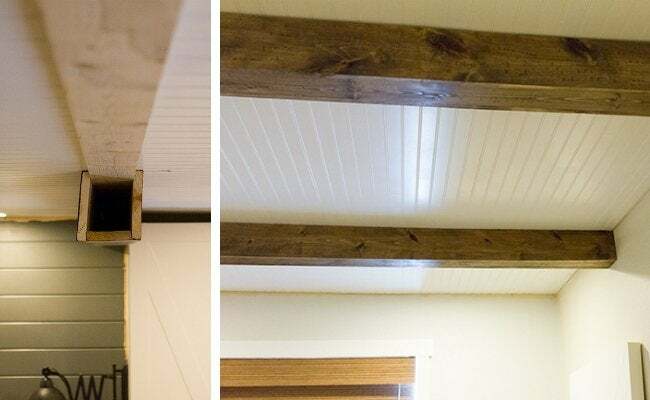 The most difficult part for us was (without a doubt) installing the beadboard ceiling, with the DIY beams coming in second, but we managed to make it all work! You’ve executed so many skills in the process: ripping out carpets, installing planked walls and wood beams along the ceiling, wiring lighting…. Was this your first time doing any of these projects? The beadboard ceiling was a first—and we probably won’t do it again without the proper tools and manpower! 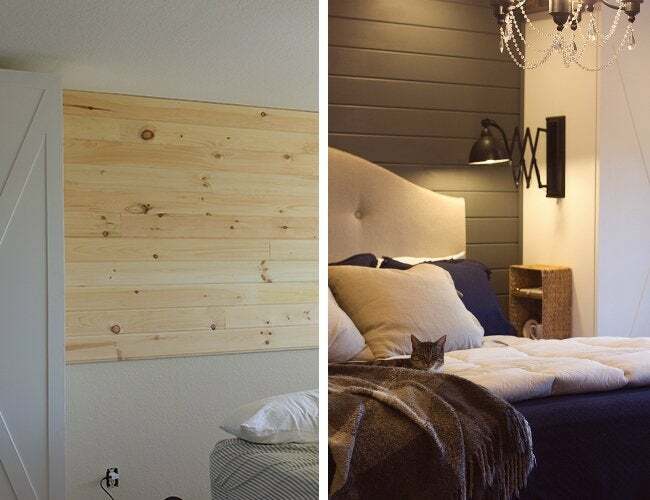 Between my husband Brad’s bad back and my 100lb self, trying to keep panels from falling on our heads, aligning them perfectly with one hand and passing each other the nail gun across the room with the other, it was a nightmare. That was a rough day. The square panel wall was also new and ended up being easier than I thought. It was also my first time designing, cutting, and installing door molding, which I am pretty proud of. It wasn’t our first time installing planked walls, beams, and molding/trim or wiring lights and speakers, but each time it becomes easier and faster. Wow, you seem like a seasoned pro! What would you say you learned during this particular renovation? There was a ton of woodwork involved, so I’m definitely more comfortable after this room renovation knowing what to expect now. Large sheets of hardboard/beadboard are more challenging than I thought; seeking out straight, unwarped boards can make or break a project, and I will always choose MDF when possible. I also had many opportunities to refine my table saw, miter saw, and jigsaw skills. The planked wood walls continue throughout your home—in the foyer and your studio, specifically. Do you have any helpful advice that you’d share with readers attempting to do this in their own homes? What’s your favorite feature to the room? So tough to answer! Aside from the view, I’m really pleased with the way my DIY vintage mirror turned out. I’m also obsessed with the beams—they just add such a unique feeling to a room. Thinking about the architectural features added and room design, how did the renovation help you meet your initial goals for the room? We definitely utilize the storage space from the wardrobes. I turned mine into a vanity, which I’d never really had before—it’s so fun having my accessories organized and displayed. Our bed takes center stage (it’s a King pillow-top and the most comfortable thing ever), so we never leave it when we’re in our room. And we like to use our laptops/tablets in bed, so the built-in charging stations Brad wired up through our storage basket “nighstands” are the perfect hub for keeping everything charged at night.